It spent over six years on the UK album chart, but with over 14 years on the U.S. album chart it remains the record holder for the longest run of any album in U.S. chart history. It was the first Pink Floyd album to feature Roger Waters as its sole lyricist. Dark Side of the Moon is a reference to lunacy, nothing to do with space. 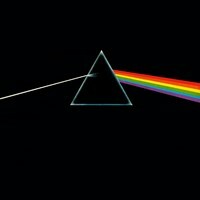 The previous year Medicine Head released an album called Dark Side of the Moon and it forced the member of Pink Floyd to rethink their title and came up with Eclipse. When the Medicine Head album sank without trace, Pink Floyd decided to revert to their original title. The shortest track is Speak to Me at one minute and seven seconds and the longest is Us & Them which runs to seven minutes and 49 seconds. Us and Them was written by Rick Wright and Roger Waters in 1969 as an instrumental called The Violent Sequence and submitted for inclusion in the soundtrack of Michelangelo Antonioni’s drama Zabriskie Point. Three Floyd tracks, Crumbling Land, Heart Beat Pig Meat and Come in Number 51, Your Time Is Up, were included Us & Them was rejected. Clare Torry was a 22-year-old session vocalist who Parsons discovered and used her voice on the The Great Gig In The Sky. The band didn’t know what instructions to give, they just said, ‘There’s no lyrics, it’s all about dying’ so she imagined herself as an instrument and tried to interpret the song’s theme of mortality. She never heard anything after the session and assumed they didn’t like what she did. She only found out when she saw the album in a store and found her name in the credits. She went on to sing the TV theme to Butterflies. The inane laughter heard on the opening track Speak To Me and again on Brain Damage belongs to the band’s road manager Peter Watts. His daughter is the actress Naomi Watts who appeared in Home and Away and the 2005 remake of King Kong. The Pink Floyd members were die-hard Monty Python fans and, when the Pythons ran into financial trouble for the making of their 1975 film Monty Python and the Holy Grail, they offered to assist with profits from sales of the album. The recording of the distinctive intro on Money, which includes cash register sounds and clanging change, mostly took place at the band member’s homes. Nick Mason recalled in his autobiography, “I had drilled holes in old pennies and then threaded them onto strings which is one of the sounds on the loop of seven.” Another was done by Roger Waters who recorded coins spinning around in an old bowl that his wife Judy used for her pottery.